Pakistan Link covering the event – please click here. It was a pleasant Saturday afternoon on 20th August 2016—an excellent day for a number of social and community events going on in Metropolitan Washington Area. However, more than 120 literary connoisseurs flocked into the Auditorium of Arlington Central Library to be the part of the Annual Yaum-e-Azadi (Independence Day) Mushaira-Kavi Sammelan. This annual event has been a part of Washingtonians’ literary life for the last eight years. It is organized by the Aligarh Alumni Association, Washington (AAA-DC) in collaboration with the Global Organization of People of Indian Origin (GOPIO)-Metropolitan Washington Chapter. The main goal of this program is to provide a forum where diverse people could get together transcending political, religious, regional, and geographical boundaries promoting Ganga-Jamuni culture of the Subcontinent. In addition to sharing poetry, this event also recognizes local poets and authors by releasing their recently published books. In the recent past, a number of poets and authors have released their books through our program. Some of them are: Professor Satyapal Anand, Professor Asghar Wajahat, Dr. A. Abdullah, Dr. K. Mohan, Mr. Raj Kumar Qais, Mr. Anadi Naik, Mrs. Rashmi Sanan, Mrs. Daler Deol Aashna, and Mr. Surender Deol. This year, recently published books by three poets, namely, Dr. Astha Naval, Ms. Daler Deol Aashna, and Mr. Dhananjaya Kumar were released. Commenting on Ms. Aashna’s book Tu Hi Tu: Rumi and Tagore, Dr. Harswarup Singh, a former Vice-Chancellor and Ambassador, said that Ms. Aashna has done a great service as she brings these two great poets in a language that appeals to the reader. Dr. Moazzam Siddiqui, who was rightfully introduced at the podium as “walking and talking library,” discussed Mr. Dhananjaya Kumar’s books, Lambi Udan Tak and Adhkhuli KhirkiyaN. His comments can be summarized as, “Dhananjaya Kumar’s poetry captures large meanings in very few words”. Remarking on Dr. Astha Naval’s book Visthaapit Man, Ms. Sukesh Chopra appreciated the blooming of the young poet. Metropolitan Washington area is very fertile in producing high caliber literary personalities and it is always a challenge to provide sufficient time to listening of each poet in detail. This year the following poets shared their poetry with the audience (arranged alphabetically): A. Abdullah, Abdur Rahman Siddiqui, Astha Naval, Bina Goindi, Daler Doel Aashna, Dhananjaya Kumar, Khurram Yousuzai, Qaisar Abbas, Rashid Jamal, Saqiq Bajwa, Sukesh Chopra, Vandana Singh, Vipin Tripathi, Vishakha Thakar, and Yousuf Rahat. The poetry recitation session was presided by a senior poet, Mr. Abdur Rahman Siddiqui. Mr. Masood Farshori, AAA President and Dr. Renuka Misra, GOPIO Chairperson welcomed the participants and audience on behalf of their associations. Coordinator, Dr. Zafar Iqbal thanked everyone for their continued support for the program, which was conducted by Dr. A. Abdullah. 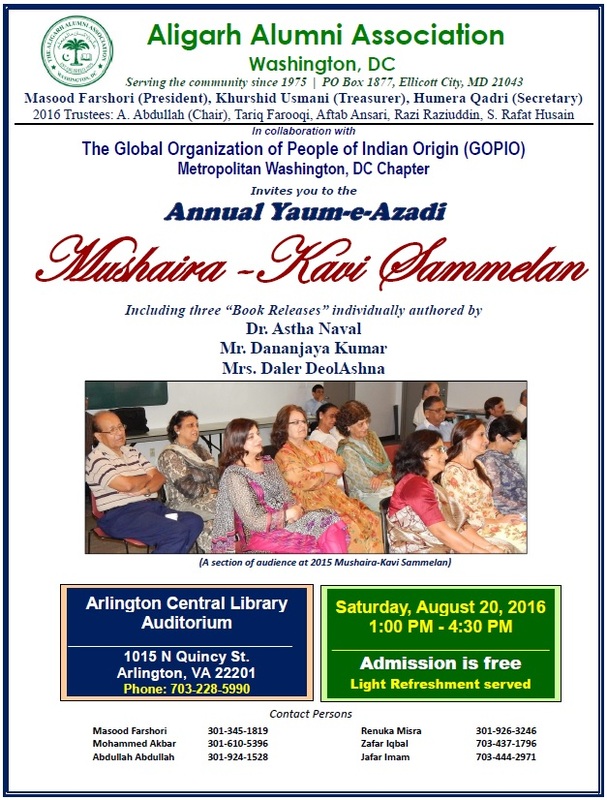 The Aligarh Alumni Association of Metro-Washington (AAA) and the Global Organization of People of Indian Origin (GOPIO)-Metro Washington are jointly organizing 9th Annual Yaum-e-Azadi (Independence Day) Mushaira-Kavi Sammelan (poetry recitation) in Metro-DC area. This annual event celebrates Ganga-Jamuni culture of the Subcontinent. In addition to poetry recitation by Urdu and Hindi, we also honor authors/poets of Metropolitan Washington area. This year, we will be releasing recently published books by Mr. Dhanajaya Kumar, Mrs. Daler Ashna Deol, and Dr. Astha Naval. Saturday, 20th August, 2016; 1:00-4:30 PM. This event is organized as a service to our literary patron. There is no entry charge or ticket. 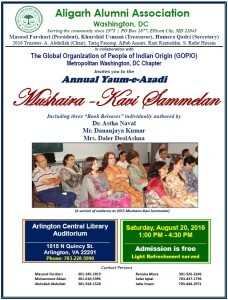 The AAA is organizing a Hindi-Urdu Mushaira on Saturday, August, 20, 2016, at Arlington Central Library, VA, to mark the independence days of India and Pakistan. The program coordinator, Dr. Zafar Iqbal, has announced that the event will include a book-release ceremony, while participation of prominent Urdu and Hindi poets of the Greater Washington area is anticipated. More details will be forthcoming shortly.